Blood thinners are medicines that help blood flow smoothly through your veins and arteries. They can protect against heart attacks and strokes, but who needs them? What are the benefits and risks associated with taking them? Are there alternative treatments to blood thinners? We posed these questions to Dr. Christopher Rogers, a cardiac electrophysiologist at Penn State Health Medical Group – Berks Cardiology. Description – The video begins inside a conference room at Penn State Health St. Josephs Medical Center. Two people are standing next to each other. Standing from left to right is Dr. Christopher Rogers and Scott Gilbert. Scott Gilbert – Live from Penn State Health St. Joseph, this is Ask Us Anything about Blood Thinners. I’m Scott Gilbert. Blood thinners are a class of medicines that help blood flow smoothly through your veins and arteries. They can protect against heart attacks and strokes. In this interview, we’re going to learn about who benefits from blood thinners, what the risks are, and especially about one alternative to them that’s a good fit for some patients. We’ll learn about that from Dr. Christopher Rogers. He’s a cardiac electrophysiologist at Penn State Health Medical Group, Berks Cardiology. Dr. Rogers, thanks very much for your time today. Let’s start with the two different types of blood thinners. There are anticoagulants and antiplatelets, so what’s the difference there? Dr. Rogers – So antiplatelet agents are things like aspirin and other medications you may have heard of, like Plavix, that are used in patients mainly who have coronary artery disease, so blockages in their heart arteries, they may have had stents placed, and those medications keep their stents opened and keep them from having heart attacks in the future. Scott Gilbert – So how do blood thinners work, generally? Especially I know we’re talking today focusing on anticoagulants. How do they work? Do they actually make the blood thinner or just perhaps less likely to clot? Dr. Rogers – Right, so the antiplatelets which keep the platelets, which are part of the blood products from sticking together, are different than the anticoagulants. The anticoagulants do actually thin the blood out. There are clotting factors that are made by the liver, and there’s a whole cascade of those factors that go into actually forming a clot, and these medications, like Coumadin or warfarin and some of the newer agents that are available, interrupt that cascade at different spots. Scott Gilbert – You’re watching Ask Us Anything about Blood Thinners from Penn State Health St. Joseph. We’re talking with Dr. Christopher Rogers of Penn State Health Medical Group, Berks Cardiology. We welcome your questions for him. Just put them in the comment field below this Facebook post. Whether you’re watching this live or if you’re watching it after the fact, we’ll make sure we track down an answer for you for those questions. So what are the names of some common blood thinners, you know, those medicines that maybe a loved one is one them, we didn’t realize that that’s what it was. Dr. Rogers – Well, the most common one is probably Coumadin, or warfarin, and I think everybody’s heard about Coumadin and warfarin and people have a love/hate relationship with it. It’s been used for approximately 70 years, and patients, although some need to be on it, some do not like being on it because there’s a lot of blood work and dosage changes that are involved. So several years ago, alternatives finally hit the market and those alternatives are medications called Pradaxa, Xarelto, and Eliquis. Those are the most commonly used of the new agents. Scott Gilbert – And so we’ve talked a bit about what blood thinners are, what they do. What are some of the conditions that necessitate them? What are the most common reasons people are on them? Dr. Rogers – So the most common reason for patients to be on blood thinners like warfarin or those newer agents that I just mentioned is atrial fibrillation. Atrial fibrillation is an irregular heartbeat that can cause blood to pool and clot inside of the heart and subsequently can lead to a stroke. Scott Gilbert – Now, atrial fibrillation, I think a lot of us have heard of that, but are some of the most common causes of AFib? Dr. Rogers – Well, aging is probably the most common cause of atrial fibrillation, but there’s still a lot about AFib that we don’t know. We are starting to understand that uncontrolled blood pressure, obesity, uncontrolled diabetes and blood sugar can all contribute to atrial fibrillation, and we’ve known for quite some time that sleep apnea, if untreated, can contribute to atrial fibrillation. Scott Gilbert – And there are other types of heart rhythm disorders. For example, tachycardia where the heart beats fast. Maybe that’s not as dangerous medically, but AFib is considered to be a risk because of strokes. Can you talk — kind of walk us through how AFib can cause a stroke? Dr. Rogers – Absolutely. So some of the other tachycardias don’t put patients at risks for blood clotting and strokes because the contraction is more regular and not as fast. Atrial fibrillation is a very chaotic rapid rhythm starting in the top chambers of the heart, and when that rhythm is ongoing in the top chambers of the heart, the top chambers kind of quiver like a bowel of Jell-O rather than ejecting the blood nicely into the bottom chambers and that can cause the blood to pool and then it can clot, and there’s a little pouch off of the left top chamber of the heart where those clots can gather. If they leave that area and get into the circulation, it can cause a stroke. Scott Gilbert – So then blood thinners help to prevent those clots from happening. Scott Gilbert – Okay. And when it comes to diagnosing or, I should say, putting somebody on a blood thinner, how does a physician find the right dose for that individual, because I imagine there’s a balance that needs to be struck there in terms of making sure it has an effect but not too much of an effect. Dr. Rogers – Correct, there is definitely a balance. So with Coumadin and warfarin, it involves very frequent lab work, so initially when somebody gets started on Coumadin or warfarin, they have blood work checked once a week to bring the blood level into a desired range that says the blood is just thin enough but not too thin. If the blood is too thin, they’re at risk for bleeding. The newer medications are a little bit different. They are basically just an off and on switch, so once you take these medications, the blood is thinned in a relatively rapid period of time. The dose adjustments involved with those newer medications are not based around any sort of lab work or detail like that. They’re based around kidney function mostly. Scott Gilbert – You’re watching Ask Us Anything about Blood Thinners from Penn State Health. We’re live at Penn State Health St. Joseph today welcoming your questions for Dr. Christopher Rogers. He’s with Penn State Health Medical Group, Berks Cardiology. So, Dr. Rogers, some people take an aspirin a day for its effect as a blood thinner. You mentioned before that the aspirin is considered an antiplatelet. What’s your take on that? Because I know there are a lot of articles, a lot of advice pointing both ways on that. Dr. Rogers – Yeah, that’s kind of a loaded question and, you know, some people think that aspirin, to take one daily like a vitamin may just help prevent all that ails them. It definitely can have a protective effect in some patients, but it’s not without risks. So taking aspirin can cause gastrointestinal bleeding, and I don’t think that everybody should just take an aspirin. There are certain risk factors that we can look at whether somebody has a family history of early coronary disease, if they have uncontrolled cholesterol, blood pressure, and just the usual risk factors that we look at. There’s a scoring system and we can actually score them and see if they would benefit from taking a daily aspirin. Scott Gilbert – So it definitely differs from person to person. There’s no one-size-fits-all approach there. Scott Gilbert – So we’re also — let’s go back to blood thinners a bit, talking about things like Coumadin. They’re not without risks either, including, you know, you figure if the whole point is to not allow your blood to clot, that can be a bad thing. It can lead to bleeding both inside or outside the body, right? Dr. Rogers – Correct. So, you know, things we have to worry about when people are on blood thinners is gastrointestinal bleeding, that would be the internal bleeding that you’re talking about. You know, we also have to worry if somebody falls a lot, that they’re going to fall and hit their head and they might bleed into their brain, or just in general, somebody gets into an accident, they’re going to bleed easier than somebody that’s not on a blood thinner. Scott Gilbert – So those are all things that they have to keep in mind in everyday life. Scott Gilbert – All right. What are some of the other issues? I understand, especially when it comes to interactions with certain foods, vitamins, alcohol, so blood thinners, again, striking a balance, right? Dr. Rogers – Correct, so especially with Coumadin and warfarin, there were dietary restrictions. The antidote to Coumadin is vitamin K, so if you eat a diet high in vitamin K, it’s going to alter the way that the Coumadin thins out the blood. The newer medications, you really don’t have those dietary limitations or interferences. Scott Gilbert – When you mentioned internal bleeding in your other answer, I’m wondering: What are some of the symptoms of that? So if someone falls and hits their head, how would they know if they might be in trouble with internal bleeding, or is that just something they would have to go seek medical attention for? Dr. Rogers – They would have to go seek medical attention. You know, from a head trauma standpoint, I think that they’re going to know if they’re in bad enough shape that they need to seek medical attention. As far as the gastrointestinal bleeding, patients might experience bright red bleeding in their bowel movements or even dark tarry bowel movements that would suggest that they have a bleed a little bit higher up in the GI tract. Scott Gilbert – I’ve heard it’s very important for people to tell all of their doctors that they’re on blood thinners, even their dentist. Is that right? Dr. Rogers – Absolutely. Any procedure that they have, whether it’s a simple dental cleaning or a major surgery, can open them up to higher risks of bleeding, and I don’t think that there’s any surgeon or proceduralist that would want to find out too late that somebody was on a blood thinner. Scott Gilbert – So somebody can still have surgery if they’re on blood thinners, but there are precautions that need to be taken. Dr. Rogers – Absolutely. So we can kind of look at the patient’s risk and if they are low-risk, we can have them off of the blood thinners for a certain period of time and then restart them soon afterwards. Other patients may need to have their blood thinner bridged with an IV blood thinner, such as patients that have mechanical heart valves which are another reason for somebody to be on blood thinners, and some patients have mechanical heart valves and have atrial fibrillation and have multiple reasons that they need to be on the blood thinners. Scott Gilbert – You’re watching Ask Us Anything about Blood Thinners live from the campus of Penn State Health St. Joseph. Your questions for Dr. Christopher Rogers of Penn State Health Medical Group, Berks Cardiology are welcomed. Just add those to the comment field below this Facebook post, and we hope you find this information useful. If you do, please make sure you share this on your Facebook page so we can help this information reach so many more people. Now, there are some alternatives out there to blood thinners and they’re available for certain patients. I’m thinking specifically of something called “the Watchman procedure.” Can you talk about, first of all, who’s a candidate for Watchman and why would somebody perhaps and their physician want to think about it? Dr. Rogers – Yeah, so the Watchman is the, essentially, the only studied option to taking blood thinners in patients that have atrial fibrillation but who cannot take blood thinners long-term. Maybe they have recurrent gastrointestinal bleeding and the source can’t be found or fixed, or maybe they are a patient who falls very frequently and we are very concerned about them falling and hitting their head and bleeding into their brain. Years ago we would have basically had to make a choice of what’s better, having them on the blood thinner and taking the chance of the bleeding or having them off of the blood thinner and taking a risk of them having a stroke. But fortunately we have this device called “the Watchman” available to us now, which is a mechanical device that will block the area in the heart where the blood clots tend to form. Scott Gilbert – We actually have a visual here to show people exactly what it is and how that works. The Watchman is located over on this side of the heart, right? Dr. Rogers – Correct. So the Watchman is on the — it would be implanted on the left top chamber of the heart. The procedure is done under anesthesia and it’s done through the groins. A catheter is brought up to the heart, to the right side, and a small puncture is made through the middle of the heart, to the left side of the heart. We have to take a lot of pictures and do a lot of things to evaluate the patient’s appendage to see if it’s suitable to have the Watchman device placed. There are a few different sizes we can use, and then we deploy the device into that appendage, and then what happens is that device completely blocks that appendage where the clots would form and the body will heal tissue over the Watchman device and it would almost make it as if that appendage was never there. Scott Gilbert – It seals off the left atrial appendage, basically, which I guess people can live without? Dr. Rogers – Correct, yeah. There’s not a real good reason to have that appendage as some other things in our body. Scott Gilbert – It’s like an appendix. You don’t really need it to live. Scott Gilbert – All right, very interesting. And like you said, it just — it doesn’t ever need to be removed. It just stays in there and then other tissue grows over it. Dr. Rogers – Correct, and it actually can’t be removed, so once that is in there, it is in. Scott Gilbert – But it solves the problem of, again, like you said, blood pooling in that part of the heart possibly leading to the formation of clots. Dr. Rogers – Correct, and most patients will be off of blood thinners. They do have to be on them for a short period of time after the procedure, so for about 45 days after the Watchman’s implanted, they need to be on Coumadin or one of the other blood thinners and the aspirin. At that time, we do another evaluation of their heart, look at the Watchman inside of their heart, and if that looks good, then they are on aspirin and another antiplatelet agent called Plavix that’s usually used in patients with stents for the remainder of the first six months. At that point in time, the Plavix is discontinued and they are on an aspirin for the rest of their life along with the Watchman device. Scott Gilbert – But an aspirin, better than blood thinners, per se. Dr. Rogers – Correct, yes. Scott Gilbert – And you mentioned the procedure, how it’s implanted. It’s sent in through a catheter in the groin through the other side of the heart. How long does that whole procedure take? Dr. Rogers – In general, it takes about an hour. Scott Gilbert – Oh, okay, not that long, then. Dr. Rogers – Yeah, it’s a generally fairly straightforward procedure. Now, some people’s anatomy can give us a little bit of a challenge and it would take a little bit longer. They’re usually in the hospital overnight and we send them home the next day. Scott Gilbert – And other alternatives have been explored, are being explored, but from what I understand, this is the main alternative to blood thinners that’s out there right now. Dr. Rogers – Correct. It’s the only FDA approved and studied alternative to blood thinners. There are other devices that are in the works, and, actually, we welcome that because they may have different shapes and may be more suitable for patients whose appendage is not right for the Watchman, and we have had several of those, that the Watchman just wouldn’t work with their appendage. I say you can’t fit a square peg into a round hole and that would be it. When surgeons are doing open-heart surgery on patients and replacing valves or doing bypass surgery, oftentimes if they know that a patient has atrial fibrillation, they can actually surgically clip that appendage, and that’s a good option. There’s never been a big study that puts patients that have had their appendage clipped against those who haven’t, but it’s an alternative. And there was another procedure being done a little bit more a few years ago that would do the same thing but from a minimally invasive standpoint. That is undergoing another trial right now, but it is not being used commonly. Scott Gilbert – So if someone’s watching this video right now thinking, you know, I think I might actually have AFib, but there’s no pain and my heart’s still beating, I feel okay, what’s your advice to them? Dr. Rogers – You know, if there’s a reason to believe that they have atrial fibrillation, they really need to be evaluated. The patients with AFib run the gamut from having zero symptoms to having terrible symptoms and not being able to get through their activities of daily life. Atrial fibrillation by itself is not a life-threatening arrhythmia, but it can make life difficult, and even in patients that are asymptomatic, they are still at risk for blood clots and strokes whether they have symptoms or not. So it is really important if there’s any evidence that somebody has atrial fibrillation or any concern that they be evaluated. Scott Gilbert – All right, Dr. Christopher Rogers, thanks so much for your time today. Appreciate it. Dr. Rogers – Thank you for having me. Scott Gilbert – All right, Dr. Rogers is a cardiac electrophysiologist at Penn State Health Medical Group, Berks Cardiology. 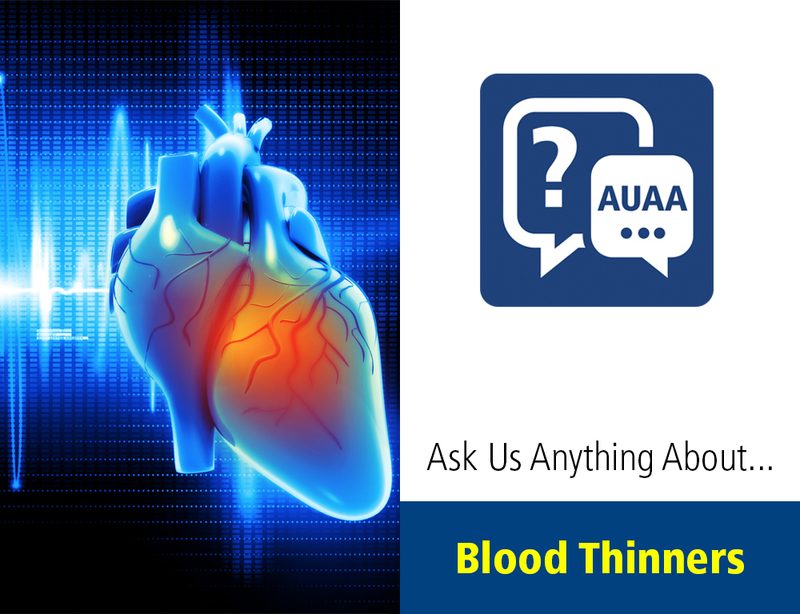 He joined us in this live edition of Ask Us Anything about Blood Thinners from Penn State Health St. Joseph. Thank you for watching.